Woooo, I'm just making it under the wire with this spring list. It's not that I forgot about my lists project, I just thought I needed to make a list of the ways I could cleanse my life for spring like I needed to write a note to myself not to drill a hole in my head: I KNOW. DUH SPRING CLEANING, CLEAN THE FRONT ROOM. And relatedly, I was making fried shallots the other day and musing making fried shallots is like churning butter: nothing is happening, nothing is happening, nothing is happening, and then all of a sudden magic is happening ::heart eyes emoji:: and then as an afterthought i guess all life is like churning butter, and as it happens, cleaning the front room has been shaping up a lot like churning butter. Magic is happening! I don't know how it's happening! And the magic is spreading through the whole apartment, an almost visible blanket of sparkle like bibbidi-bobbidi-boo. Grainy! There's a reason I don't take pictures in or of the bedroom, there's almost no light back here. I've never posted a picture of my bedroom, so you don't know what it looked like before. 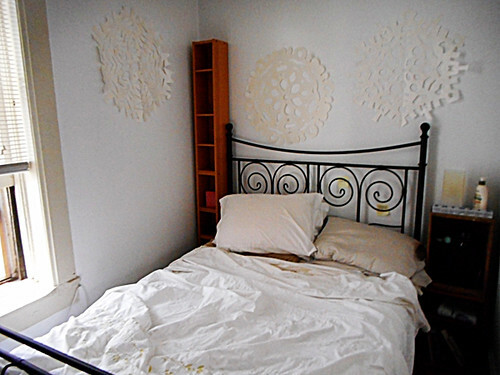 But you know, just picture it without that six-inch space; the right edge of the photo is basically the opposite wall. Smol! The tall skinny bookcase is der schweet's, it's been floating around the front room for the past year. Idk there was just a moment when I looked at it and thought, that's about six inches innit? So the bookcase went in the corner, and now MJ has shelves on his side of the bed! I had to rotate the wooden crates that I use as bedside shelves from landscape to portrait to fit them in, but they're totally better like that. MJ made me a little extra shelf for the bottom crate, that's where I stow my laptop when I go to sleep. Behind the crates was where the only full-length mirror in the house used to be, that's stowed for now in the pantry and I can pull it out as needed. What do I need to see myself in the mirror for anyway, every day I wear the same clothes. Weirdly the one time I miss it is when I'm putting on lotion. So, I'm sorry for calling you a white lady blogger. I don't actually ...know if you're white? When you're right, you're right: it has changed the whole energy of the room. P.S. I made that bed. When MJ makes the bed, it looks a lot nicer. Okay so, like in April I rearranged the furniture in the front room and pulled this red dresser out. Totally meant to finally take it out back and, well, you know. Somehow, though, it found its way into that corner of the kitchen where the gear crates used to be. And basically we've had three months to find that that extra surface is really handy. It's weird, it's the sort of surface that collects things but it doesn't for some reason. 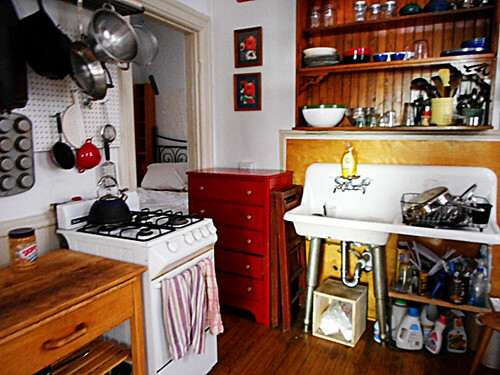 I put my laptop there when I'm cooking, because I cook from my blog. MJ likes to stand there and read, for some reason. Whatever makes him happy! Anyway after three months I finally realized I could put things in the drawers again and clear up other overcrowded spaces. The top drawer has my baking sheets and racks, the second drawer has all the odd-shaped attachments for my handblender and mixer. And I guess I have finally come into my own as a middle-aged Asian woman, because now I officially have a bag drawer. Two bag drawers! I put backpacks that I can't bear to get rid of in the third drawer, and good plastic bags in the bottom drawer. "Good" plastic bags ::shiver:: did I ever tell you about cleaning out my parents' house after they died? First of all, it took us like eight months to clean out the house and then we realized: the garage. So then we were cleaning out the garage, I pull down a box that's labeled PLASTIC SHOPPING BAGS and open it and yep, plastic shopping bags. Before I leave this story, also a folder labeled MT FOLDERS filled with—did you guess, empty folders? Bahaha. That's the edge of them sticking out from behind the door, I found two cabinets in the alley! This is not usual in our house, MJ is the finder. They're just a squosh narrower than the alley-picked cabinets that were previously in the foyer, and that opened up some space to put—you know what this is, it's the side support for an IKEA shelf system that I bought as the piece de resistance of my apartment organization like a month before MJ moved in and turned all that on its head. So like, it's been in the pantry (where the full-length mirror now is) for the past eight years. But look, it's basically a ladder! Like on Pinterest! 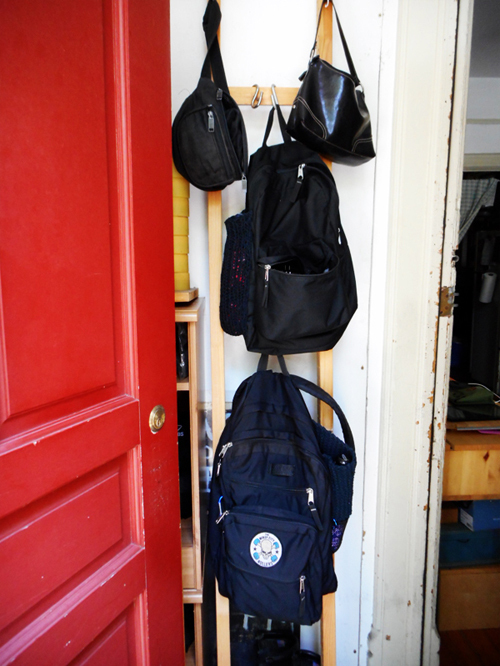 I put hooks on it, and now I hang my actual working backpacks and other bags here. THIS IS EVERYTHING. We have been walking around my backpacks on the front room floor for I don't even want to think how long.